Making a good hire can be expensive and it can definitely take more time than you anticipated. Across industries, business leaders are focusing on making high-quality, strategic hires, which is one of the reasons why it takes longer to make a hire today, than ever before. Right now, it takes an average of 29 working days to fill a job in this country, but the outliers of this trend are what’s truly frightening. According to data from Workable, the industry average for filling tech jobs is 58 days but, as you can see, the length of the candidate search (and thus, the cost) can be much greater when filling certain positions. A month-long vacancy is bad enough, but CareerBuilder estimates that, on average, employers lose more than $14,000 for every job that stays vacant for three months or longer, and this cost can be upwards of 25,000 for more advanced positions. In order to reduce your recruiting costs, you must first have a complete understanding of these costs. If you only have an “idea” of what your total recruitment costs are reaching, then you may be in for a nasty surprise at the end of the quarter or even halfway through a candidate search. But, before we get into calculating the cost of your company’s recruitment, let’s explore some of the most common drivers of high recruitment costs. Extended Vacancies Extended vacancies drive up your recruiting cost by prolonging the variable costs of the hiring resources that your company uses. Additionally, extended vacancies are detrimental to the productivity and morale of your employees. Forced to take on extra and/or unfamiliar work, extended vacancies can push your hardest workers past their limits and can inspire them to find a new, less stressful position. Bad Hires Besides being bad at their job, bad hires also end up costing you a great deal in recruiting expenses. Forgetting what it cost you to source the bad hire in the first place, the price of replacing bad or mediocre employees always depends on the position that is being occupied by the poor performer. 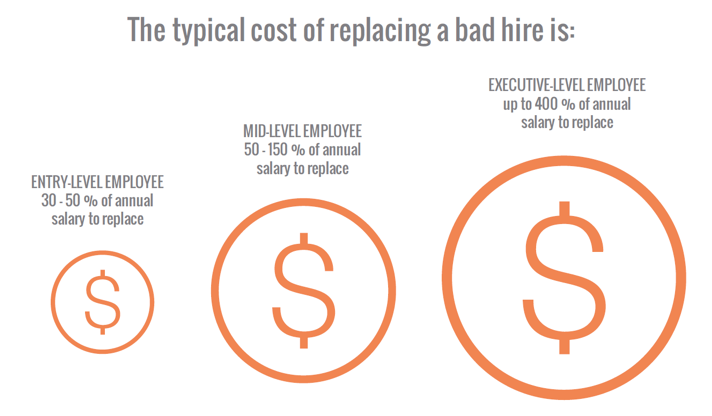 However, avoiding this high recruiting cost driver is as easy (and difficult) as not making bad hires. When we’re pressed for time on a hire, there is an understandable tendency to trade quality for making a hire right then and there. The only problem is, you’re hiring a full time employee, not a contractor, and the person who you was “good enough” 6 months ago, may now be completely out of their depth. If you suspect you’ve made a hiring mistake, make sure that you are benchmarking performance from day one so that you can build your case to fire. The last thing you want is for a poor performer to hang around for months or even years after they’ve revealed their unimpressive selves. Though it can be painful to re-boot your candidate search, settling in the hires you make is never advisable and when you calculate your recruiting costs this will always end up costing you more in the long run. High turnover drives up your recruiting costs through the sheer volume of hires that it forces you to make. On top of this hard cost, high turnover is terrible for the morale of your employees and highly disruptive to the work that is done at your company. If a trend of high turnover is allowed to run wild, then you will start to be hit with multiple vacancies at once as more and more employees desert what they perceive to be a sinking ship. However, by emphasizing retention and career progression within your company, you can help to avoid or curb a trend of high turnover. Nobody wants to feel like they don’t have a future with their employer, so make sure that there are no dead-ends in your company’s structure. Everyone has a job to do, but providing employees with the training resources to advance to new positions will create a company culture that actively fights turnover and promotes continuous learning and skill improvement. There are a couple of metrics that you can use to measure your company’s recruitment costs. The first metric is cost per-hire and, this data point is found by dividing total recruitment costs by the number of hires made over a period of time (quarterly, annual, etc.). [Download the FREE Cost Per Hire Calculator Here] This metric, however, can be a little muddled when a company hires for both high and low salaried jobs. Your averaged cost per hire is still a telling metric, but segmenting this cost per-hire data by job title or department will show you which jobs or groups of jobs are breaking the bank. This will allow you to anticipate the cost of hiring for specific jobs and give you the chance to reduce these costs. The total cost of recruiting for any position is comprised of a collection of internal and external recruiting costs. External Costs (job board fees, agency and/or recruiter fees, background checks, etc.) include all spending on external recruiting/candidate sourcing resources during the measured time period. Internal Costs (portion of salaries paid to any internal recruiting staff during measured period, recruiting/candidate management software, rewards for employee referrals, etc.) include any internal spending on recruiting during the measured time period. Once you have collected all of this cost-data over a quarterly or yearlong period, simply apply this formula to discover your company’s cost per-hire. You can also measure the cost per hire for specific positions with this formula. Accurately calculating cost per-hire depends on your ability to catalogue all recruiting expenses associated with the candidate searches that you undertake. It can be a lot to keep track of, but good record keeping will show you exactly which jobs or which hiring solutions are taking the biggest bites from your budget. Once you have this baseline data, you can attack some of the common recruiting cost inflators (extended vacancies, bad hires, high turnover) and watch as this metric starts to swing in your favor.